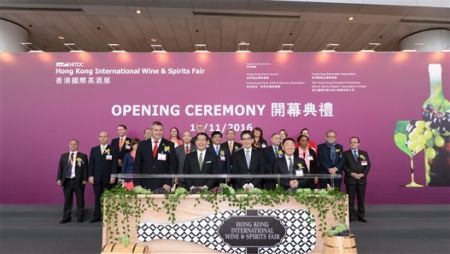 HONG KONG, Nov 10, 2016 - (ACN Newswire) - The ninth HKTDC Hong Kong International Wine & Spirits Fair opened today and continues through 12 November at the Hong Kong Convention and Exhibition Centre (HKCEC). This morning's opening ceremony was officiated by Gregory So, Secretary for Commerce and Economic Development of the Hong Kong Special Administrative Region (HKSAR) Government and Philip Yung, Permanent Secretary for Commerce and Economic Development (Commerce, Industry and Tourism) of the HKSAR Government. Speaking at the opening ceremony, Benjamin Chau, Acting Executive Director, Hong Kong Trade Development Council (HKTDC), highlighted the diverse characteristics of the International Wine & Spirits Fair. "Featuring more than 1,060 exhibitors from 37 countries and regions, the Wine & Spirits Fair is an effective international promotion platform. The success of the fair is due to a variety of factors: Zero duties on Hong Kong wine imports since 2008, a large international exhibitor presence, international buyers especially wine importers from Asia, high value-added business opportunities and networking activities including grand tasting sessions, master classes, wine tastings, cocktail demonstrations as well as seminars," Mr Chau said. Since the HKSAR Government scrapped import duties on wine in 2008, the wine industry has recorded tremendous growth, attracting industry players to start or expand their business in Hong Kong. The value of Hong Kong's wine imports rose from HK$1.6 billion in 2007 to HK$10.8 billion in 2015, a more than six-fold increase. Being a well-known wine trading and distributing hub, wine exporting countries are seeking to tap into the Asian market through Hong Kong. Besides Croatia, Finland and the Philippines exhibiting at the fair for the first time, wine producing regions, wine associations and trade commissions from around the world have formed 30 pavilions to promote their products. Among them, first-time group pavilion organisers include the Azerbaijan Export and Investment Promotion Foundation, Bulgarian Wine Export Association, Economic and Information Technology Commission of Guizhou Province from the Chinese mainland, Fukushima Prefectural Government and Kyushu Shochu Culture & Tourism from Japan, FENADEGAS from Portugal, the Distilled Spirits Council of the United States, and the Ministry of Agriculture, Forestry and Food of the Republic of Slovenia. Located in South Central Europe, Slovenia is a wine producing country less familiar to consumers in Hong Kong and Asia. Slovenia's viniculture is characterised by the country's diverse geography and microclimates; its latitude aligns with many renowned and prolific wine-producing regions like Bordeaux, Burgundy and Northern Rhone. Around 70 per cent of Slovenian wines qualify as premium wine. Aiming to capture the attention of Asia's developing markets through Hong Kong, Dejan Zidan, Deputy Prime Minister and Minister of Agriculture, Forestry and Food of the Republic of Slovenia, hosted today's presentation under the theme of "Discover Excellent Wines From Slovenia - Taste the Slovenian Identity". - Wine from Israel, a country with 5,000 years of wine-making history. Produced by Hevron Heights, Armagedon (Booth no. : 3E-D11) is brewed using traditional methods. Using grapes grown on the Judean Mountains at high altitude (950m) and aged for 24 months in French oak barrels, Armagedon is regarded as kosher wine, produced in accordance with Judaism's religious laws. - Bulgarian orange wine from Wine Cellar Villa Melnik Ltd (Booth no. : 3D-B26). Orange wine, in spite of its name, is not made from oranges. Its darker colour results from extended contact of white grape juice with grape skins over a longer period of time. Orange wine is intense with a dry, tannic taste and nuttiness derived from oxidation, and can be paired with a wide variety of dishes ranging from beef to fish. - Crown Royal's Northern Harvest Rye from Canada (Booth no. : 3CON-064). Crown Royal's Northern Harvest Rye stunned the whisky world as the first Canadian whisky to earn a title in the authoritative Jim Murray's Annual Whisky Bible with almost full marks and was named World Whisky of the Year 2016. In addition to zones such as Wine & Liquor Products, Whisky and Spirits and Friends of Wine, where the perfect food pairings are showcased, there are also dedicated zones promoting the industry's all-round developments, such as Wine Investment, Wine Education and Wine Storage & Logistics zones. During the Wine & Spirits Fair, more than 70 special events are arranged to provide a comprehensive platform for trading and exchange. These include the Wine Industry Conference, gala dinner, tasting sessions, master classes and thematic seminars. Close to 50 wine tasting sessions are organised to spotlight wines from Austria, Australia, Bulgaria, France, Germany, Guizhou (Chinese mainland), Japan, Mexico, Portugal, Slovenia, Spain and the US. Today's Wine Industry Conference is titled "Uncover the Opportunities of the New Cool Climate Wine Trend". Meanwhile, the eighth edition of the Cathay Pacific Hong Kong International Wine & Spirit Competition Award Presentation Ceremony will be held tonight. Following the cocktail reception, the Gala Dinner titled "I FEEL SLOVENIA" will feature a menu prepared by Janez Bratovz, head chef of celebrated Slovenian restaurant JB RESTAVRACIJA. The seminar "How to Reach the Right Customers in China" and the buyer forum "Uncovering Business Opportunities in Booming Markets of Wine and Spirits" will be held tomorrow afternoon for the industry to discuss hot topics. On Saturday (12 November), the fair will be open to members of the public aged 18 or above, with tickets priced at HK$200*. Public visitors with full-priced tickets on that day will receive a Lucaris crystal wine glass valued at HK$110 on a first-come first-served basis while stocks last. Two master classes will be held on the public day including "Understanding Quality in Wines Currently Trending around the World with Jeannie Cho Lee MW" and "Sensory Experience of Wine by Debra Meiburg MW". The public are also welcome to join wine tasting sessions, cocktail, whisky and spirit demonstrations and seminars. These include "Gifu Sake and Pottery Appreciation", "Enjoy Shochu from Kyushu with Kumamon", "Choosing from a Wine List - Tips and Tricks" and "Hong Kong Inter-University Wine Challenge 2016". This year's fair once again headlines the Hong Kong Wine Journey citywide promotion, which encompasses a series of wine tastings, wine and food menu pairing, seminars, themed tours and Lan Kwai Fong carnival. More than 160 restaurants will feature promotions such as "Birthday Wine" and "Wine and Food Pairing Menu". For more details, please refer to the Hong Kong Wine Journey map or the website. In the first nine months of 2016, Hong Kong's wine imports reached HK$9.1 billion, a 22 per cent year-on-year increase. As for the city's exports, they totalled HK$4.1 billion, up 25 per cent over the same period last year. Members of the public can purchase Public Day admission tickets on site priced at HK$200. Tickets for Public Day master classes are priced at HK$350 (including admission) and are available on a first-come first-served basis. Media may register on-site with their business cards and/or media identification.